I am promoting my business in order to create customer awareness of my new shop. If I do not promote my business nobody will know about my business. Task 6 Promotion I am promoting my business in order to create customer awareness of my new shop. 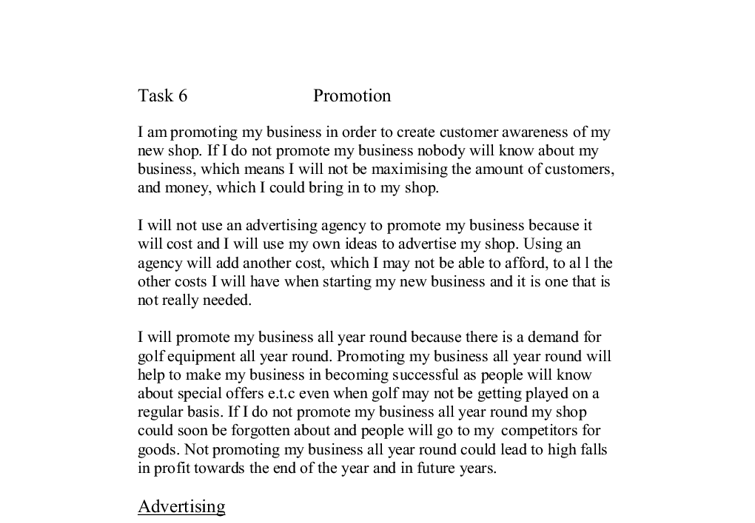 If I do not promote my business nobody will know about my business, which means I will not be maximising the amount of customers, and money, which I could bring in to my shop. I will not use an advertising agency to promote my business because it will cost and I will use my own ideas to advertise my shop. Using an agency will add another cost, which I may not be able to afford, to all the other costs I will have when starting my new business and it is one that is not really needed. I will promote my business all year round because there is a demand for golf equipment all year round. Promoting my business all year round will help to make my business in becoming successful as people will know about special offers e.t.c even when golf may not be getting played on a regular basis. If I do not promote my business all year round my shop could soon be forgotten about and people will go to my competitors for goods. ...read more. Using posters to advertise is a very cheap and fairly effective way of advertising. Advertising in magazines is a cheap way of advertising. Using magazine adverts is an effective way of advertising but you can only advertise in specific magazines i.e. golf magazines but then these magazines may be viewed by people all over the country who wont travel all the way to Macclesfield to buy golf equipment. Advertising in newspapers, magazines and using posters are effective ways of advertising but can only be used in the local area which means there would be no point advertising in a national newspaper or putting posters up in London when the shop is in Macclesfield as it would cost more money and would be pointless. I will use local radio, local newspapers and posters in local areas to advertise my new shop. I am going to use these methods of advertising because they will target the people who are most likely to visit my shop. I will not use television or magazine advertising because they will not reach my target audience. ...read more. They administer the British codes of advertising and sales promotion to ensure that adverts are legal, decent, honest and truthful. The main role of the ASA is to make sure that all adverts are suitable, honest and truthful before they are shown on television and radio. The ASA will restrict me from using adverts that are not true, decent or not representative of the products I have to offer in my shop. In my advert I will not be able tell lies about equipment, prices, offers e.t.c or use pictures in my newspaper and poster adverts that are violent or ill mannered. I don't think the ASA will affect my adverts too much because most of my adverts will be in writing and I will only have to tell the truth in order to make them legal. Independent television commission The ITC licenses and regulates commercial television services in the UK except S4C in Wales. They put viewers first by setting and maintaining standards for programmes, advertising and technical quality. The main role of the ITC is to license programmes and to make sure that they are suitable for viewers to watch. 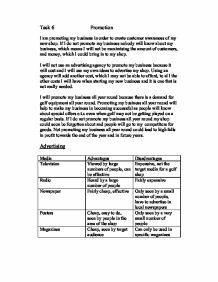 The ITC wont affect my advertisements because I will be using radio and posters to advertise my shop. ...read more. largest market in Argentina, Buenos Aires, which made up 30% of the total population. Gallo's best avenue for growth in this economically depressed country would probably be by increasing awareness of its discounted rice line, the Nobleza Gaucha brand, through advertising. This is a very important factor that The Sun must consider when making its pricing decisions. By working out the price elasticity of demand, the newspaper will then know just how much control it will be able to exert over the price it charges at 35p weekdays and 55p weekends. The marketing objectives: * To introduce a new product into the market * To increase the sales of an existing product * To target a new market segment * To stop a decline (decrease) in market share * To change the image of a brand. It is crucial that the event be large enough to attract a minimum percentage of potential viewers. Additional follow-up campaigns must be consistent and continual until the market has been saturated with the news of the new cable television show. Please put him down for 3 tonnes at least." And in the same breadth, Desai expressed shock over Girjee's sales performance in relation to the tetra-packed fruit drink 'Healthy'. He exclaimed: " He is carrying unsold stocks of 2 tonnes of 2 tonnes - what happened?' Kapoor explained these stocks represented flavours, which Girjee did not want, but which the food division had insisted on pushing. Nike has joined up with some great partner companies along the way to help extend its reach to a wider range of consumers as well as boosting its overall market share. Nike has joined forces with Converse, Cole Hann, Bauer and Hurley, who each cover different sectors of the sporting goods market.